Deep breaths, Darren. Calm down. It’s already been a cracking year for videogames as far as I’m concerned. Even as I find myself in the newly responsible fatherly position of not being able to buy all of them nowadays. The Legend of Zelda: Breath of the Wild and the Nintendo Switch, however, have been among my few purchases and so far, I couldn’t be much happier. Especially with the knowledge that there are more lovely-looking videogames coming, including more than one which is inspired by some of my all-time favourites from my most beloved console, the Nintendo 64. Snake Pass is – clearly – one of these. You play as Noodle – a charismatic, charming and colourful serpent who is hell bent on collecting all the wisps, coins and … gems(?) in each of the game’s 15 levels. I’ve always been on the positive side of collectables if they’re done intelligently. Pace them well and don’t oversaturate the environment and you’ll find the player is willing to engage with the controls, learning new skills as the adventure progresses. Sumo Digital’s efforts here are well thought out. There’s not an overwhelming amount of things to collect and they aren’t used in multiple systems to confuse the player. They are for the most part literal collectables, and not essential to progress. Visually the game is a joy, sparking immediate Viva Piñata/Banjo-Kazooie: Nuts & Bolts vibes. Honestly, I wouldn’t be surprised if we end up seeing this lovable spiralled creature in Playtonic Games’ Yooka-Laylee somewhere. The two games’ aesthetics seem almost separated at birth. If you’re like myself and enjoy Rare Ltd’s previous works and that didn’t set your heart racing then I’m not sure anything will ever again. So, what is it actually like to control Noodle? Sumo Digital’s previous works have been a joy to play and for a little while, it seemed like they had another hit on their hands… that’s until I got to level 6. One of the most frustrating experiences I’ve had in a videogame for a long time. Noodle controls pretty much how you’d expect a Snake to if the developer were going for a semi-serious ‘Snake Simulator 2017’ experience. Slithering (aka “Snaking”) ensures a smooth transition across the terrain, something which takes a fair bit of practice but ultimately pays off and feels quite rewarding. 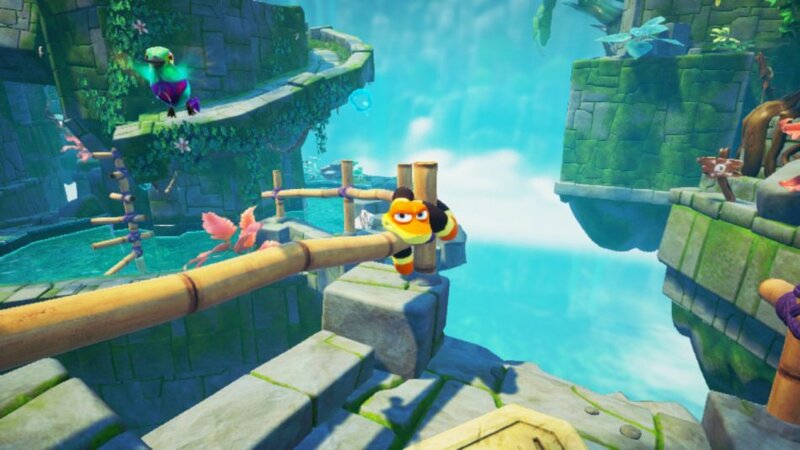 As with certain other platformers, your playable Noodle is one-half of a duo, and here we have a birdy buddy named ‘Doodle’. He/she can lend a helping… beak/wing by lifting Noodle’s rear-end off the floor. Doodle’s role reminds me somewhat of Miles ‘Tails’ Prower in Sonic 2 and is quite adorable, even more so than the leading reptile hero. Wriggling around the game world’s various ledges is fun while submerging in water is as delightful as it could be with a cracking David Wise score accompanying the action. 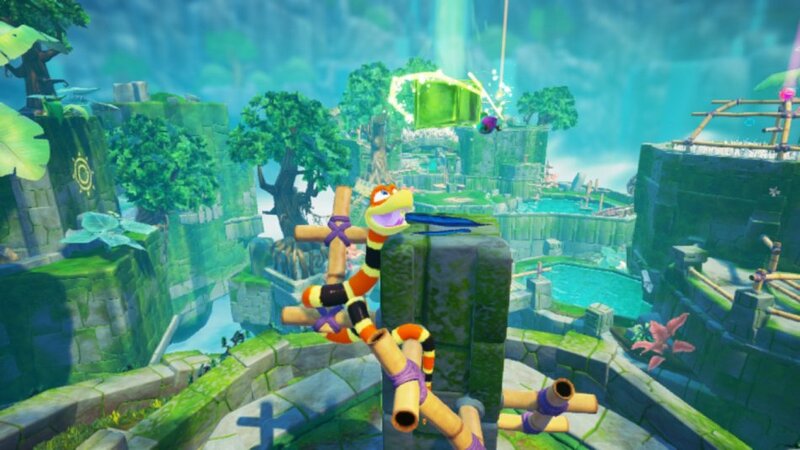 However, my real issues started to occur when traversing the bamboo, Snake Pass’ equivalent to regular ‘platforming’. Cue a frustrating sequence of ungainly flips, flops, fumbles and failures. 25 minutes later, I am stuck in the same position as when I first attempted the final part of level 6. Plus the checkpoint system isn’t being kind to me and honestly, I just want to stop. So after a few profanities, I rage quit. What you’ll probably see more of, sadly. 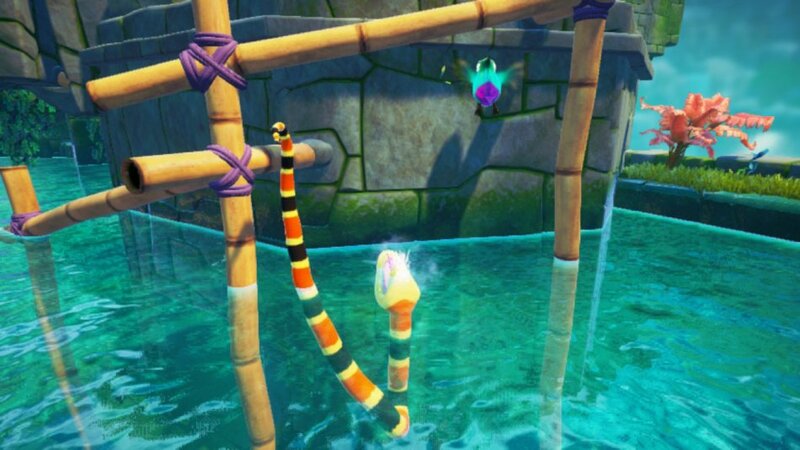 My problems with Snake Pass come as much as anything from the juxtaposition of the game’s bright and cheerful stylings, suggesting a family friendly experience but offering a headache-inducing control scheme (even on easy mode), along with the game’s lack of wanting to tell you explicitly how well you’re doing. Noodle slips and slides around during those – ahem – bamboozling moments, and I’m not entirely sure why. I’d happily have some of my Switch screen taken up with a grip-o-meter, just to prevent me from losing my progress. It feels unfair at times and when that happens, you’ve lost me. Combine with that unskippable cut-scenes for those who want to replay levels and you’ve got an experience which is teetering on being something special but could use at least a patch, if not a little more time in testing. It feels almost as though Sumo’s dedication to making you feel like you’re being a snake is at odds with its target audience. Like if Banjo-Kazooie controlled like Octodad – and not in a comically good way. Snake Pass is available to download now for PlayStation, Xbox One, PC and Nintendo Switch priced around £16 to $20/€20. Interestingly this is exactly how I felt after rushing through the first few levels and suddenly hitting a difficulty spike. However, I went back and replayed the earlier levels practicing and learning the controls and it slowly started to click. It’s as much about getting a feel for how noodle controls than the controls being poor. I’m not sure a grip meter would help, but a better camera would definitely be useful.